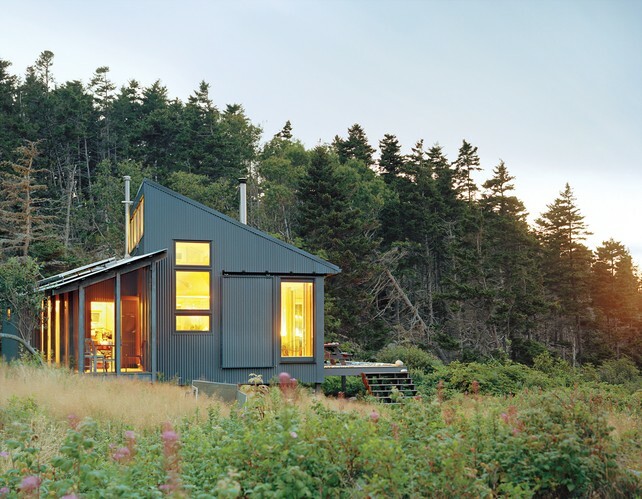 A project 30 years in the making, this tiny off-grid retreat on a coastal island in Maine is almost entirely self-sufficient. Designed and built by Alex Porter for her father, the project features a shed roof and is wrapped in a distinctive blue-grey corrugated skin. Dwell recently profiled the home, which is the only solar-powered retreat on the isolated island – its sustainable power source actually makes life a lot more leisurely, as the family does not need to schlep in fuel to run a noisy generator. They didn’t give anything up, as they have all the conveniences of a regular home — but with a view you don’t get in an everyday residence. The house is situated on a tiny sleeve of rock tucked close to the water. The sturdy steel cladding was chosen for a good reason: the northern squall can be relentless. The cabin has a series of rolling storm panels that ward off the elements. When the sun shines, a small solar-electric panel mounted to the southern facing roof feeds 12v DC to the batteries, which in turn powers lights, a super efficient Sunfrost Refrigerator, and a small water pump. A large rainwater catchment tank provides more than enough water for the home, and a small on-demand water heater supplies an outdoor shower and the sink. Given the remote location of the property and the site’s lack of power, the design made careful use of all materials so that everything is spaced on 24-inch centers. Most of the finishing materials were sourced locally and floated in. One big question remains — what to do when you need to use the loo? A Sun-Mar composting toilet does the job, transforming the waste into fertilizer. While none of the systems are ground-breaking, the design is a transparent example of how well off-grid living can work, and how we can live in nature without polluting it. The Future of world, alternate energy. I agree with judy ... Does anyone ever answer any of the questions on these forums? It always seems as though people have a lot of interesting or relevant questions that might start a discussion. As a suggestion to the moderators of this forum, perhaps if there were someone from inhabitant who followed up on any of these stories from time to time, these comment sections would be more valuable and therefore more used. you know, building a community of ideas and all that. I really need to consider this as a real choice! How can we get the plans? How much money does it cost to build the home? I've been in this home, as well as several others on the island. The majority of homes are solar powered, and at least seven of them do not need a generator (though they may have one for back-up purposes.) There are a couple of homes which don't have generator back-up, and rely entirely on solar energy. It's a wonderful place ... a world unto itself! How much did this cost to build? How do we acquire a set of plans for this home? How big is the water catchment tank? EXCELLENT JOB CREATING THAT HOUSE . I do enjoy viewing small homes with reusable energy> I would love to see more ideas for grid prof living for all seasons. Great job on this set up and design. Great 3 season design. I would love to see more like this here in the Adirondacks. The toilet looks like a Sunmar composting toilet. Look at the BoonJon System by C-Head. It is a much better composting toilet for this application. I have been searching for a lofted small home floor plan... this is the BEST! Do you think this structure or one very similar to it could be built with structural insulated panels? 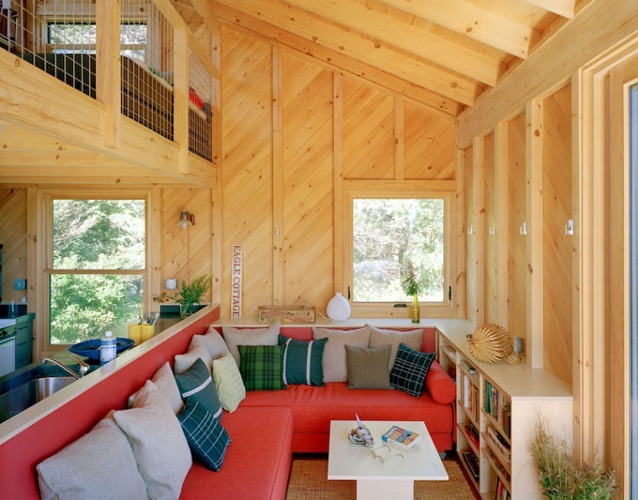 Love this tiny cabin: how to get in touch with Alex Porter for floor plan?? I love this but the winters can be brutal in Maine....how comfortable will they be then??? How is it in the winter? Thanks for your astute eye Marandah. We've made the corrections. To the author or editor of this site - This is perhaps the first post that I have come across on inhabitat.com and, pardon me for saying, I am completely surprised by the amount of typos in this short post! It looks like there is some great content here, but this is the sort of thing that drives me away from media outlets! Thank you for bringing great things in the world to the public eye. I hope a bit more attention is given to future posts on this site. Hi, Your home looks intweresting and would like more information. where can i find the floor plan with dimesnions for that house above? I would love to build it on hunting land or on a small lot at the lake with waterfront view. Very nice, but it is using wood for most of the fuel. I like wood, and it is very nice to use if you don't have asthma, and are capable of cutting it. Otherwise natural gas or propane would be just as green IMHO. I assume that is a composting toilet. Do they make one that doesnt require a stepladder and the balance of a Wallenda? In our off grid cordwood cabin in upstate New York we use a hula hoop with two Dollar Store shower curtains on it, the ones with magnets in the hem, an old metal wash tub, and a backpacker shower in the winter. Just leave it up for the night and it will be dry in the morning. Snow melt is most of our water. Drinking water is from a spring. Wood heat of course and solar electric (12v) using cfls and LED lights that I have built. People seem to be interested in cost. Ours cost $10/sq ft. Today it would cost about $12. Search for "cordwood cabin in Harrisville NY." to see some pics. I love seeing fertile minds creating wonderful, useful, low impact items. Am quite interested in solar, wind and reusable energy. This is a cool solution to a cabin in only one place. On youtube the video name is mogvideo1.mov showing a 40 foot, totally solar, shallow 18 inch draft and capable of being rolled up on shore. Wait a sec. "Outdoor shower?" Aren't we in Maine?!?!? Newbeak, a spiral staircase would have provided slightly more floor space (maybe), but would have completely made the space underneath it unusable. Don't think in terms of maximizing floor space, think in terms of maximizing usable floor space. Anyways Spiral stairs are annoying sometimes. Does anyone ever answer any of the questions on these forums? It always seems as though people have a lot of interesting or relevant questions that might start a discussion. As a suggestion to the moderators of this forum, perhaps if there were someone from inhbitat who followed up on any of these stories from time to time, these comment sections would be more valuable and therefore more used. you know, building a community of ideas and all that. that's remarkable! do you have an estimated cost to build? How many times have you smacked your head on that lightbulb at the top of the stairs? This cabin is charming and amazing. Where do they get the gas for the gas stove in the kitchen? The kitchen stove and oven are hard items to make self sustaining, does anyone have an suggestions, we want to build an off grid cabin, but do not know a good option either. Great cabin, I lived in a place with sliding door covers and they work great. I would be curious to know how much it cost to build this home. This looks beautiful as well as efficient. Indoor shower in winter is a necessity in Maine, though. Just curious why a spiral staircase to the upper level wasn't used-it would maximize floor space.Otherwise,it is a fantastic cabin! This is truly fanstastic. This is what I want to do myself. 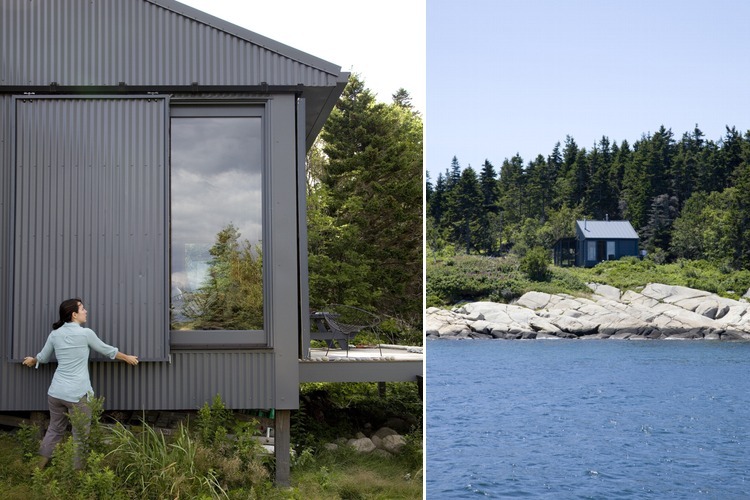 A project 30 years in the making, this tiny off-grid retreat on a coastal island in Maine is almost entirely self-sufficient. Designed and built by Alex Porter for her father, the project features a shed roof and is wrapped in a distinctive blue-grey corrugated skin. Dwell recently profiled the home, which is the only solar-powered retreat on the isolated island - its sustainable power source actually makes life a lot more leisurely, as the family does not need to schlep in fuel to run a noisy generator. They didn’t give anything up, as they have all the conveniences of a regular home -- but with a view you don’t get in an everyday residence.